3.5 stars.The fourth instalment in Pittacus Lore’s The Lorien Legacies was… interesting. 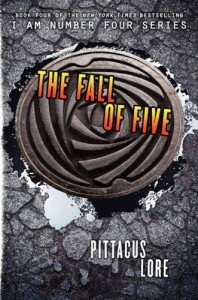 As most of you may know The Lorien Legacies is my go-to entertainment read – The Fall of Five had a few cinematic-like action scenes, one specifically involving the total destruction of Nine’s penthouse apartment in Chicago from an onslaught of Mogadorians rappelling from the roof, breaking through the windows and shooting to their hearts’ content. But there weren’t as many action scenes as there was in the predecessor The Rise of Nine. Although there was a lot of excitement throughout this instalment, it didn’t compare to what I had experienced previously, making The Fall of Five, sadly, weaker – and the weakest of the series so far for me.Additionally, despite there being many surprises regarding Lorien, the Garde, and Number Five, as well as the unexpected increase in the death toll, I felt the plot of The Fall of Five failed to deliver on ramping up the thrill and overall excitement of the series and beginning Act Two with a bang. The plot was also predictable with not much substance, a bridge book, genetically the same as a book diagnosed with Second Book Syndrome – and that probably meant nothing, though, considering I had finished The Fall of Five in one night… justbecauseIneededtoknowwhathappenednext! Perhaps I wasn’t as thrilled with the Five-related twist as it was something I had read many times before in previous series. If you take the title of this book literally you can already determine what may or may not happen in The Fall of Five before reading (of course, it could also mean that five of them would fall – but, seriously, who punishes, gets rid of, makes examples of, kills or trips five (or more) main characters in one book other than George R. R. Martin? Badasses, that’s who, and I don’t believe Pittacus Lore is one just yet). From the moment Four and the Garde came across a signal on the web of a crop sign in Arkansas (hopefully I’m recalling Arkansas correctly) I was ambivalent about Five as a character, with a strong belief that he was a danger from here on out. I just feel sorry that John, the Garde, Sarah, AND SAM (!!!!) – oh, and his dad, too – weren’t as intelligent as I was. Sad. Depressing.There’s also that year wait for the next book, which makes it considerably more depressing.I also do attribute my less than expected excitement levels to the novellas. After reading The Fallen Legacies (The Lost Files #3) I had said, and I quote, “Definite game changer for this series. Have a feeling this certain individual is going to be a major player in book four.” I had to give myself five minutes to laugh at the absurdity of my feelings – because the Garde didn’t officially meet Adam until the last two pages (despite him helping Malcolm and Sam escape the facility in New Mexico (don’t think this location is correct – I’m forgetting, eep! ), which was in the beginning, but also sort of unknown really considering we were witnessing all this through Sam’s point of view).See? What did I say? Bridge book.But, but, but, but… WE GET SAM’S POINT OF VIEW FOR THE VERY FIRST TIME. You know how happy I was when The Fall of Five opened with Sam’s POV? INCREDIBLY (as the caps lock can testify to you about right now). This was in addition to John’s and Marina’s, whose chapters just weren’t as strong in voice as they were in comparison to the previous books.Despite there being some character development for Sarah – who becomes a warrior, learning how to shoot and fight – and Ella, there was a lot more stupidity.Overall, The Fall of Five was a weak instalment in The Lorien Legacies, but still managed to introduce characters and uncover secrets that will have the fifth untitled book – hopefully – ramping up the excitement tremendously and all that great stuff that was in The Rise of Nine but amplified three times more to give the sixth book of The Lorien Legacies the opportunity to be stimulating and explosive and all those things that make a series finale worth our patience for the wait we had to suffer.